James Bond’s loyalty to M is tested as her past returns to haunt her. 007 must track down and destroy the threat, no matter how personal the cost. When Bond’s latest assignment goes gravely wrong and agents around the world are exposed, MI6 is attacked forcing M to relocate the agency. These events cause her authority and position to be challenged by Gareth Mallory, the new Chairman of the Intelligence and Security Committee. With MI6 now compromised from both inside and out, M is left with one ally she can trust: Bond. 007 takes to the shadows – aided only by field agent, Eve – following a trail to the mysterious Silva, whose lethal and hidden motives have yet to reveal themselves. Istanbul, Turkey; London, UK; Shanghai, China; Macau, China; Glencoe, Scotland. 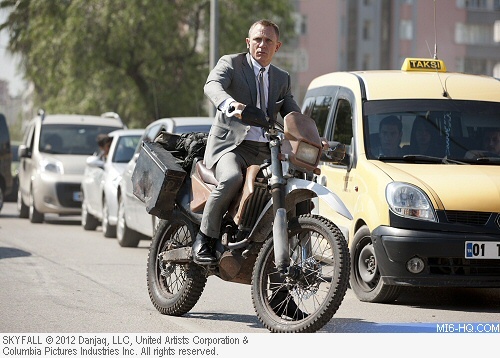 007 is sent to investigate the theft of a laptop hard-drive from Agent Ronson who is found bleeding to death in Istanbul. With the help of field agent Eve, Bond chases the thief, Patrice, through the markets and across the rooftops of Istanbul before finally facing off atop a train. When M orders Eve to take a shot despite 007 being in the way as the train passes over a viaduct, it goes horribly wrong and Bond plunges to his death. 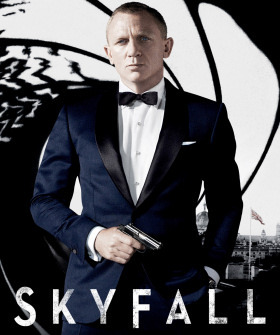 The title comes from the name of James Bond's childhood home, Skyfall Lodge, located in Glencoe, Scotland. Up against a deadline, writers Purvis & Wade came up with the name at 2am: "We needed a haunting place name. I just plucked it out of the air, and it turned out to be something that struck a chord with the filmmakers". Bond: "A gun and a radio. Not exactly Christmas." Q: "What did you expect, an exploding pen? We don't really go in for that sort of thing anymore. All London Underground escalators have safety signs placed on the medians between stairs to prevent anyone from sliding down them. The first time in the series that a recurring role is played by more than one actor in the same film. A shot of Bond running through Regent's Park as he prepares for his MI6 evaluation. An exchange between M and Mallory when she quips Bond being in the South China Sea is precise intelligence. M's Assistant is cut almost entirely from the early MI6 scenes. An establishing scene with Sévérine in Shanghai International Airport where she gives Patrice the equipment case on the escalators. Exposition scenes that explained that Sévérine sets up targets interested in buying stolen paintings only for them to be assassinated and the money stolen. A procession of hearses and producer Michael G. Wilson's cameo as a pall bearer at the funeral service for the MI6 agents. Shots of dead & wounded MI6 agents following the explosion were cut. It was attempted to place the gunbarrel before the pre-titles sequence, but this was not possible due to the opening shot of the film not matching up. Sam Mendes explains the decision in MI6 Confidential issue #18.